The productivity and wellness benefits of standing for a portion of the work day are now well established. 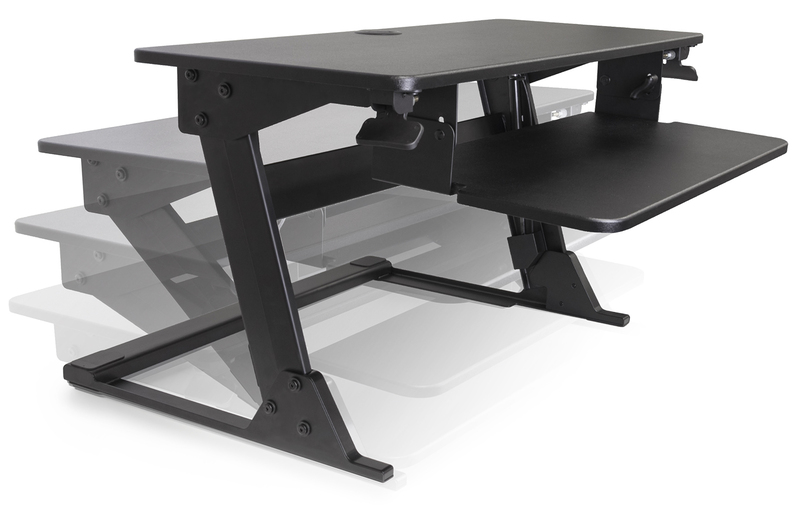 The AscenDesk Sit-Stand Workstation allows you to convert your existing desk into an adjustable height sit-stand workstation, no need to buy new furniture, and since the primary work surface can be extended up to 20" above the desk, you can find the position most comfortable for you. The gas assisted lifts provide smooth, quiet, *infinite height adjustment and raises and lowers with little effort. The large usable primary work surface accommodates 2 x 24" monitors (up to 35 lbs. ), monitor arms, an Apple iMac or laptop with monitor. *Unlike most similar products, the AscenDesk Infinite Height Adjustment allows the user to set the surface height at any point in it's travel up or down, rather than at predetermined settings which may (or may not) be a comfortable height for a given individual user.